We are available in your area? Digicom now adds satellite TV to its range of wireless services. 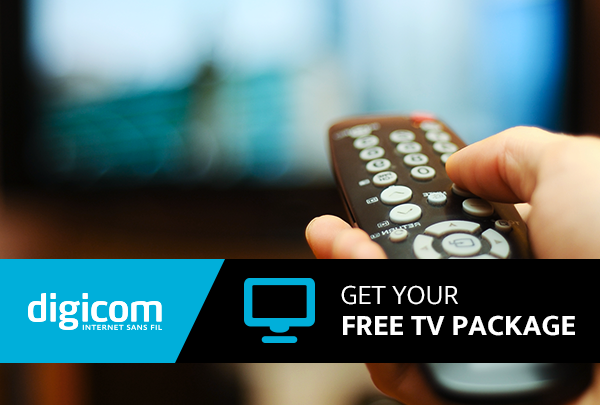 Digicom’s wireless services offer Internet, telephony and TV at an unbeatable price. The addition of new channels and pay-per-view movies and series are not included in the free package. To add a PVR, an extra cost of 35$/month is required. Other conditions may apply. The channel list is subject to change without notice. Contact us to recommend someone or validate a promotion in your sector. Contact our experts for information about our various services and accessibility to them. Opt for reliability at lower cost, everywhere and in all your projects.